The tiny Alaskan Way spot serves up individual skillets of eggs with tasty bells and whistles. I love brunch, but rarely do I indulge in it anymore. After restaurant-review dining each week, I’m not really up for another big meal out come the weekend. That’s why I was thrilled to discover Café Opla on Alaskan Way, a restaurant/coffee shop tucked surreptitiously inside the Seattle World Trade Center Building, across from the waterfront. Open only until 4 p.m., they’re breakfast/lunch/brunch only and they specialize in “oeufs au plats”—fried-egg plates, a Vietnamese street food influenced by the country’s French colonization. Served on individual skillets, the fried eggs are cooked with various meats and pickled vegetables for breakfast on the go. Here they carry on that tradition, but mix it up by adding more than the usual Vietnamese ingredients and flavors—pulling from Hawaii, Korea, China, the Philippines, and America. Inside the small but cheery space (which feels more like a coffee shop than a restaurant), you can choose from 10 options, each with two sunny-side-up eggs and a toasted baguette of the banh mi sandwich variety (which they also serve here). The Opla Vietnam is definitely one of the best, with a large, garlicky pork meatball that’s cooked for hours before steaming in its own juices. It also features slices of grilled pork, pickled carrots and onions, and a smattering of cilantro. 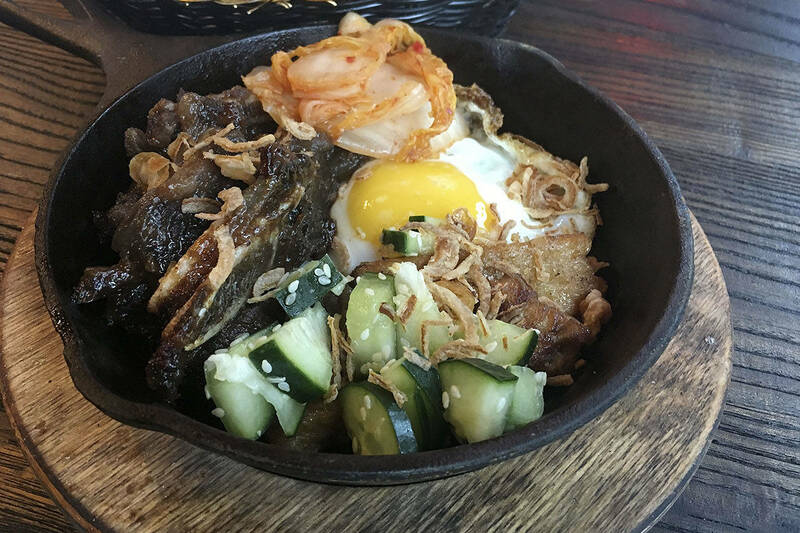 The Opla Korea was second best with barbecued short ribs, tofu, kimchi, and pickled cucumber turning a basic egg breakfast into an umami bomb. The Opla Hawaii wasn’t my favorite—Spam and super-sweet pulled pork aren’t my thing, but the addition of seaweed, fried shallots, and furikake (a Japanese seasoning of dried fish, sesame seeds, and seaweed) gives it a decidedly savory bite. The Opla Parm Eggs sounded uninspired but was surprisingly sublime. Parmesan, rosemary, and thyme impart a creamy, herbal lushness that calls to mind the decadence of dessert, without the sweetness, of course. What’s great about these plates, besides how delicious they are, is the option to get a mini ($7.95) or a regular ($9.95). I wish more restaurants would offer two portion sizes; it allows you to try more without completely stuffing yourself, or to get add-on items like a side of paté for $1.50 or an extra baguette for a buck. There are sauces too: chimi, spicy sate, teriyaki, and sweet tomato. Your server will suggest which go best with each egg dish, but I’d just get them all and play around with flavor combos. So about the banh mi: There are six varieties, including the traditional grilled pork as well as iterations with grilled chicken, meatballs, and lemongrass tofu. All come on a baguette and are topped with pickled carrot, daikon, cucumbers, jalapenos, and cilantro. They’re solid if not mind-blowing, and come with the option of adding an egg or paté (I’d go with the latter). Café Opla boasts a simple conceit, and if you’re in the mood for a quick, cheap, globally inspired breakfast, you can’t go wrong. Given all the complicated menus these days, there’s something refreshing about an establishment that just does one thing really well.